This is the standard Safariland Sam Browne style duty belt with a plain border stitch. The Sam Browne duty belt is perfect for officers who want to gear up quickly without sacrificing belt retention. 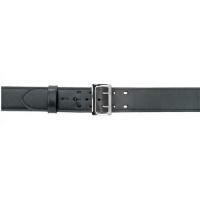 Its double-tongued buckle and center belt stud fasten the belt firmly around your waist. A free sliding keeper holds the tip in place. Designed to be used in conjunction with one of Safariland's 1.50" or 1.75" Garrison belts. Great material. Looks like it will last awhile. I'm really happy with the merchandise and the costumer service. Excellent quality, These are top of the line.